Yesterday I had the privilege of attending WCAN’s annual conference event at Goldman Sachs. It was an absolutely amazing event and the perfect pre-term kick that I needed. The theme was ‘This Woman Can: Overcoming Adversity’, a topic that we can all relate to in one way or another. Before I start to speak about the actual event, I would like to give you some background information. 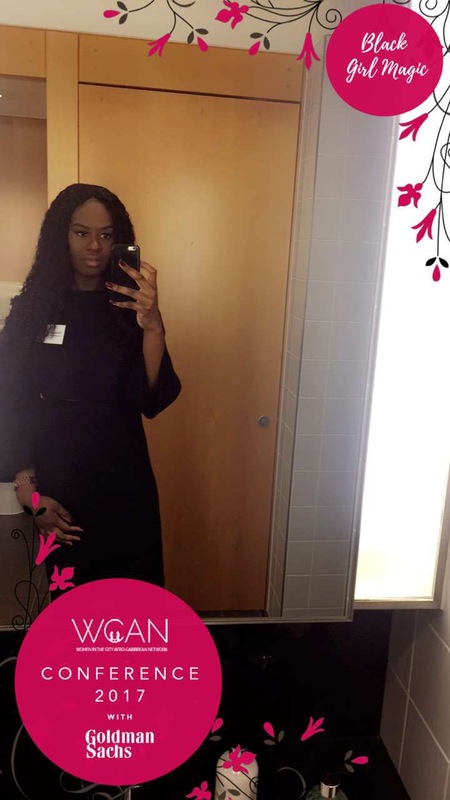 So WCAN stands for Women in the City African-Carribean Network, it is all about black female students & young professionals who aspire to work in the City- whether it be in the legal, technology or finance sector. It empowers and motivates young black women to believe in themselves & prepare them to get that dream job. With help on offer with cv and application, mentorship and networking events. Sounds fab, right? What a time to be alive! Growing up I’ve always wanted to work in the City, I just automatically believed that once I graduated from university, that I would get a good paying job in the City. I didn’t necessarily know what I wanted to study, what sector I wanted to be in or what job I wanted. As I got older, I decided that I wanted to study something Business related, however my skills & interests led me to study Law at university instead. Currently my options are still quite open career wise, my main concern right now is gaining solid degree and plenty of experience. I actually came across WCAN one day just by luck-and out of curiousity, I decided to register to their website. It wasn’t until I attended one of their events in May that I developed a proper interest towards the network, I just felt as if it was directly targeted towards me. Yesterday’s event had keynote speakers, networking, panels, talks and workshops. Throughout my first year studying law, the words ‘commercial awareness’ were thrown around so much but I didn’t actually understand what it meant. In fact, it wasn’t until yesterday that I finally realised, all thanks to Capital Moments. One of their co-founders gave an engaging talk about commercial awareness. Capital Moments actually provides commercial news for the purpose of young adults, which is so key especially as recruiters actually seek candidates who are commercially aware. Their Twitter account is @CapitalMoments and I would suggest that you follow the account & stay updated with what is going on in the world. You do not want to miss out on a job opportunity because you have a lack of knowledge. I sure know that I am grateful to them in advance! There were three keynote speakers who each spoke about their careers and their experiences, in particular the adversities that they have faced. I just love seeing powerful black women in positions that I could aspire to be in one day. This was by far my favourite part of the day! Not only was it motivating to see, but they did not sugarcoat anything. They let us know in advance that we would face difficulties and setbacks but how we actually decided to overcome them was more important than the actual set back. The first speaker was Heather Melville OBE. The one point that she really emphasised was staying authentic and true to ourselves, no matter what. I feel like it is so easy to forget who you are, in order to fit in- especially in an environment in which you are a minority e.g. A law firm in the City. However, by Heather staying authentic to herself and doing what she truly believed in, she was able to do magnificent things; she established the RBS women’s network and even received an OBE for her services on Gender Equality. Yvonne Ike, the next speaker said one thing that really stuck with me and that was ‘adversity is a necessity for growth’. If I can always keep this at the back of my head, then my setbacks would only last a minute. Because I would know that there is no progression from sitting down and moping about failures and disappointments. My only options should be to work 10x harder. Finally to end the day, Sophie Chakanda, reiterated the importance of our reputations. As black women, we are already at odds, our reputation shouldn’t be a disadvantage. Becoming a reputable person from the very beginning of your career will do you many favours. She asked us a few questions for us to think about, which were; What did we want to be known for? How did we want to be perceived? Overall, I learnt so much in this one day, that will be viable throughout the rest of my studies and in my career. I would 100% recommend that you attend WCAN events in the future if you have the opportunity to, they are honestly so life changing. WCAN came into my life at a time when I was not sure of myself & how I could pursue a career in the City. Honestly now, I am just super excited for what my future holds. Next ›Don’t forget to support your friends..